"WHERE WAS THIS BOOK WHEN I WAS RAISING MY KIDS 30 YEARS AGO?" Oh my gosh! I think this may be one of the most important books I will ever read! And I don't say that lightly. Those of you who know me or have followed my blog for a while, know I'm a voracious reader. And when I find a book of this magnitude I'm going to shout it from the house top. Daring Greatly is critical to living an emotionally healthy life! This book is a voice of reason, understanding and explanation from a woman who has spent more than a decade listening to painful stories of lived experiences in order to put a theory into words. And not just research words to complete a degree, but words that will make a difference, words that can bring a sense of meaning to the struggles we all have in common. Every person on the planet needs to read Daring Greatly! No doubt about it, this book is a tough read. Not because Dr. Brown is a researcher who writes sentences that are five lines long (which she does not) but because her material hits me right where I live inside and outside my brain. Do yourself and everyone in your life a favor... read Daring Greatly! I've just finished reading Daring Greatly and taking notes all over the book's pages. Now I have to read it again. 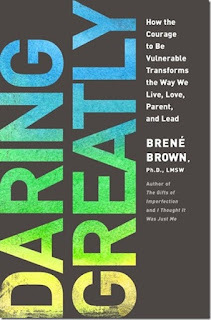 This time I'm getting out my spiral notebook and stepping into the Vulnerability classroom with Dr. Brené Brown as my professor. 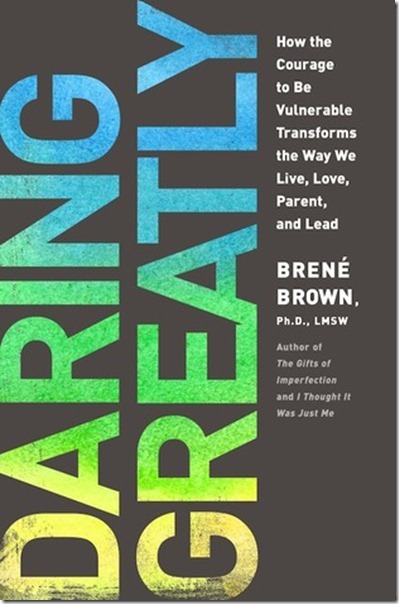 Thanks Dr. Brené Brown! I look forward to reading much more of your work! If you can't see the video screen below Click here to watch Brené Brown's ground breaking TEDx talk that has garnered more than 9 million views thus far!